Strachan confirmed he has chosen the team for the game in Tbilisi and admits it has not been easy, with Scotland looking to avenge a 2-0 defeat there in 2007. 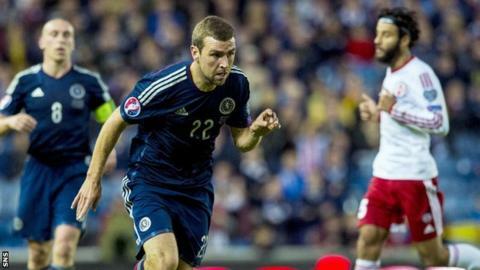 The Scotland boss insists he and his players do not fear the crucial tie despite their three qualification rivals having won in Georgia earlier in the campaign. Strachan praised the Georgians for their performance at Ibrox a year ago when his side won 1-0. "You never know how important these games are going to be," he added. "We try to win every game no matter who we're playing. "It's not been easy, I've got a lot of players playing well just now. Whoever the team is, there'll be a lot of good players on the bench. "In Scotland I thought their attitude was fantastic. I thought their teamwork was excellent. And that day I think we had to play our best football of the tournament so far to win. "They should be proud of their performance in Scotland, we were proud of our performance to beat them, we know it's going to be a competitive game." Scott Brown also warned that despite Georgia being out of the running to qualify for next summer's finals in France, they remain dangerous opponents. "It's hard coming away from home anywhere in Europe," said the midfielder. "In the last campaign when we were out we were still fighting for every result and we got a result against Croatia. They'll still be fighting for pride as well. "They've got a new manager and I'm sure he'll have new tactics and a new way he wants to play - so it's going to be a very hard game for us."